You can add a header to the top position of each mini page. You can select a separate font, color and size for each type. We have also provided four buttons that will insert the print job name, date, time and page number into the header. Date – <date> inserts the current date the job was printed using this format "month dd, yyyy"
Time – <time> inserts the current time the job was printed using this format "hh:mm AM/PM"
The fonts are scaled to match the mini-page they are used on; for example a 36 point font would be scaled down by a factor of 4 when used on a mini-page that is 4 times smaller than a regular sheet of paper. This makes it easy to set up a header, footer, or watermark that can be used for different booklet types as the text will be automatically sized for each booklet. 1. Click the Options button on the toolbar. This will bring up the Options dialog box. 2. Select the Headers tab. 3. In order to print a header a check must be placed next to the Print Headers field. Note: Header can be permanently shut off by un-checking the "Print Headers" checkbox. • Job: places the title of the first print job listed in the Print Job window. • Date: Places today's date. • Time: Places the current time. • Page: Places the page Numbers. 6. To change the look and feel of the Header click the Select Font button. The Font window will open and from here the Font, Font Style, Size, Effects, Color, and Script can all be changed. The Sample window will demonstrate how the changes will appear. 7. The Text justification allows you to choose where the Header will be placed: right, left, or center. Place a mark next to the desired position. 8. 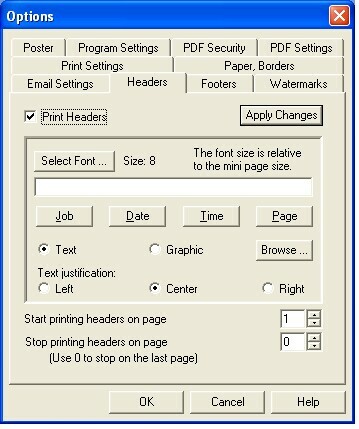 The Start printing Headers on page option allows you to choose which page the Headers will begin. Note: This feature allows you to start the process of printing Headers on the mini-page of your choice. This is useful for when you have a cover page and you don't want the page number to be printed on that page. Please note that the page numbering will start on the page you choose. For example if you start on page 3 it will be numbered as 1, page 4 will be 2 and so on. 9. The Stop printing Headers on page option allows you to choose which page the Headers will end. Note: The default setting of 0 will end the printing of Headers on the last page. 10. Click Apply Changes to view any modifications you have made to your headers. The changes will appear in the print preview window. If the changes are acceptable Click OK. Headers will now be placed on your print job. Note: Headers are not printed on posters.